‘The Walker Art Gallery,’ Liverpool. Three weeks ago I was in Liverpool for the Museums Association Conference 2013. I also visited many galleries and museums whilst in Liverpool. I have written about my experience at conference here: Part 1 and Part 2. This blog post is a continuation of my visit to The Walker Art Gallery which I have wrote about here. In my first post I discussed the permanent gallery and collection on the ground floor of the Gallery. This post shall continue to discuss the permanent exhibition as well as the painting galleries and temporary exhibition space. After the collection of items imported and exported from the Albert Docks, came the ‘Tinne Collection’ of costume from c1910 – 1940. The collection belonged to a wealthy doctor’s wife , Mrs Emily Tinne. Mrs. Tinne married Dr. Tinne in 1910 and had 7 children in quick succession. Emily had nannies to look after her children so would regularly shop in Liverpool’s exclusive department stores. Her collection covered day wear, evening wear, beach wear, children’s clothes etc from the rapidly changing fashions of the 1910-1940 era. Another theory to why she bought so many clothes in the inter-war period was because of tough economic times. Mrs. Tinne wanted to support less well off people. The so called ‘Shop Girls,’ of the era worked only on commission and having a regular customer such as Mrs. Tinne would have meant a steady income. 1920’s Cloche Hat & Shoes. 1930’s Black rayon/silk weave dress with silver circular machine stitch detail. Detail of above 1930’s evening gown. 1930’s ‘Opera Coat,’ Ermine fur. After the display of dresses was a small seating area with books about Mrs. Tinne published by the museum and information on the Tinne family. There were large exhibition panels with pictures and information about Emily and her family. I thought this gave an interesting personal touch to the dress display. It made it feel more ‘human.’ As in there was a personal and family history behind the dresses. Below you can see the seating area and exhibition panels I have described. Mrs. Tinne was indeed a most beautiful and fashionable women! Exhibition panel on the Tinne family of Liverpool. Photographic portrait of Mrs. Emily Tinne c 1910. I did not take any pictures in this gallery as I don’t really like taking pictures of paintings without prior permission. I did however take a picture of an interesting way to conserve a painting in a gallery setting. The painting beside the Degas painting had a screen over it that you lifted up to view and replaced once viewing. I thought this was a novel way of conserving items yet still having them on display. I think this picture below better conveys what I am trying to say! We also visited an exhibition on the influential British artist David Hockney whilst we were at the Walker Art Gallery. 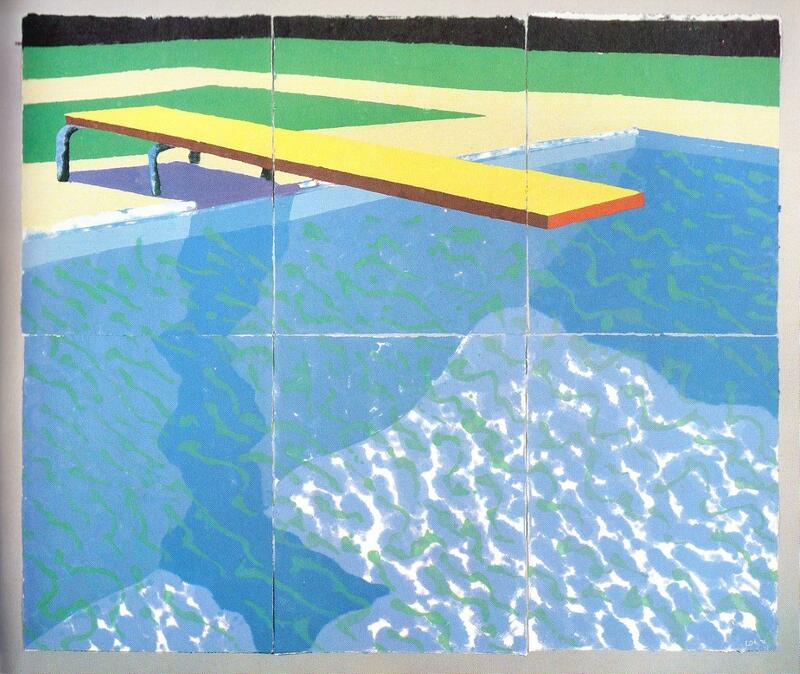 The exhibition was entitled ‘David Hockney: Early Reflections.’ The exhibition concentrated on the early years of his career, most notably the swimming pool paintings that he became famous for. I have no pictures of the paintings themselves, but the picture below gives a flavour of the type of work on display. Out of all modern British artists, I do admire David Hockney greatly. Especially, his ‘Swimming Pool’ period. His work, in my opinion, is akin to the latter stages of the Impressionist movement in the late 19th Century. The soft pastels and rounded edges are very impressionistic in form, shape and manner. The exhibition was excellently laid out with clear way finding signs and information on the individual paintings and artists life. Obviously not written by me but a little girl called Rachel! 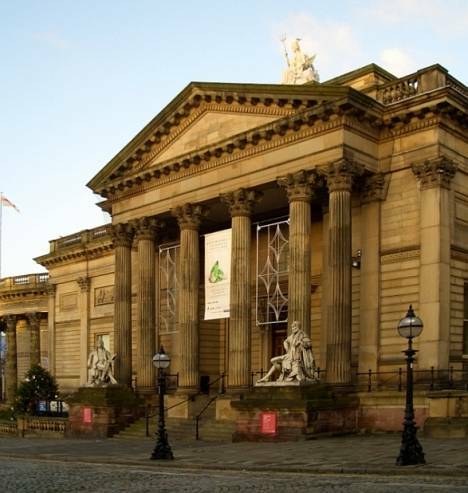 I think a lot of museums could (and should) take lessons from the Walker Art Gallery in Liverpool. Here is a what some would perceive a ‘traditional’ gallery to be using modern museum practice to turn what people think a museum should be on its head. It is modern, interactive, forward thinking in it’s approach to displays and social inclusion. The gallery obviously values it’s audience greatly and takes on board their feedback and ideas. I think if you are ever in Liverpool, take the chance to see the gallery and experience it for yourself. It is definitely a fantastic gallery space! All photos (c) Rachel Sayers 2013 unless linked/stated. Previous Post ‘Please Do Touch!’ The Walker Art Gallery Part One.